Home / DESTINATIONS / Happy New … Splash! Songkran, Thailand’s traditional new year, embodies not only the Thais’ sanuk attitude, but also the essential caring and unity at the core of Thai society. It’s April again, usually the hottest month in Thailand… and it’s again time for “Songkran”, the traditional Thai New Year. From April 9 to 22, a spirit of good-natured fun will permeate around the kingdom. Across the country, it’s a time for laughter and entertainment; for religious ceremonies and merit-making; for families and friends and, of course, for splashing water – lots of it! Songkran is a Sanskrit word meaning to “move into,” and refers to the orbit of the sun moving into Aries. It marks the end of a 12-month cycle and the beginning of a new solar year. This traditional Thai custom of merit-making is the kingdom’s most “sanuk” (fun-filled) festival, and it’s celebrated with tremendous enthusiasm nationwide. In most parts of the country, Songkran extends over a period of three days and, in some, as long as 10 days. Songkran today is known the world-over for its characteristic tradition of water-throwing ranging from a courteous sprinkle or a polite splash, to harmless water pistols and showers from garden hoses to the well-aimed bucket or water cannon delivered in a festive spirit. Without doubt, on the practical side, Songkran is a refreshing solution to “beating the heat” in the hottest season of the year. There is, however, a much deeper significance to Songkran. Apart from marking a new beginning, Songkran is also a time for thanksgiving. It is an important time for individuals to reflect upon the many acts of kindness and thoughtfulness each has personally experienced, and to remember how such acts of generosity and compassion bring peace, happiness, and wellbeing. Songkran is also the time for reunions and renewal of family ties. At the heart of each Thai custom and tradition, there is always a logical reason for its existence, and Songkran is no exception. The festive elements of the celebration, the cultural values, the social code of conduct, and individual belief and practices are intertwined. 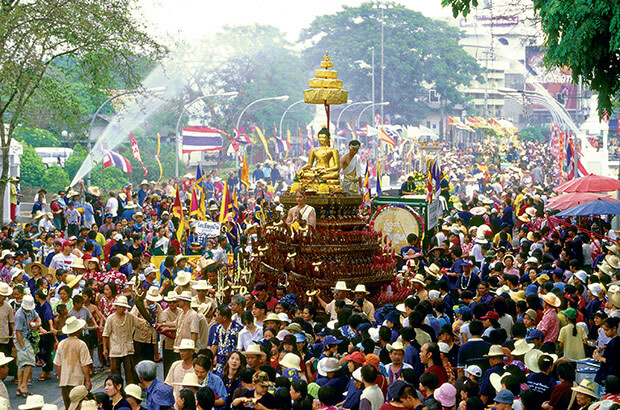 Songkran embodies the traditional Thai cultural values. The underlying significance of Songkran is the process of cleansing and purification — the purging of all ills, misfortune and evil, and starting the New Year afresh with all that is good and pure. Water is symbolic of the cleaning process and signifies purity. Today, there is no better fun festival in Thailand than this. Visitors love the celebrations, and don’t hesitate to join in the fervent water-throwing revelry that has made it famous the world over. 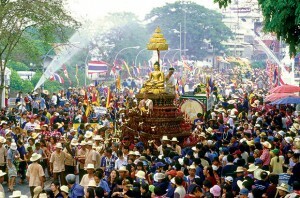 This year, the Royal Thai government has announced April 13–15 as the Songkran holiday. ● Khao San Road, Bangkok: April 13–15 from 10 a.m. to 11 p.m.
● Around the City Moat, Chiang Mai: April 12–16 from 9 a.m. to 10 p.m.
● Khao Nieo Road, Khon Kaen: April 5–15 from 10 a.m. to 8:30 p.m.
● Patong Beach, Phuket: April 12–13 from 10 a.m. to 10 p.m.
● Hat Yai Midnight Songkran (at Nipat Uthit 3 Road, Sanehanusorn Road, and Wat Mahatta): April 11–15 from 10 a.m. to 11 p.m.
● Songkran Ko Samui (Chaweng Beach): April 13 from 9 a.m. to 10 p.m.